Baltimore pride was throughout the evening. Maryland State’s Attorney Marilyn Mosby and her husband, Maryland House of Delegates member Nick Mosby, introduced the group, who rocked the show with the 1996 hit “Tell Me.” Fans bumped through mid-90’s single “Big Bad Mamma” until the opening trio — energetic Sisqo, smooth Nokio, and new soprano Tao — were joined by soulful Jazz to perform “Never Make a Promise.” The performance included a breakdown to which women in the audience were showered with fitting nicknames such as Chocolate, Caramel, and French Vanilla accordingly. Dru Hill continuously referred to the fans as friends, which indicated a rapport so close when the group convened in silence, the friends began to sing the lyrics to their wedding-classic, “Beauty,” which was performed a cappella. 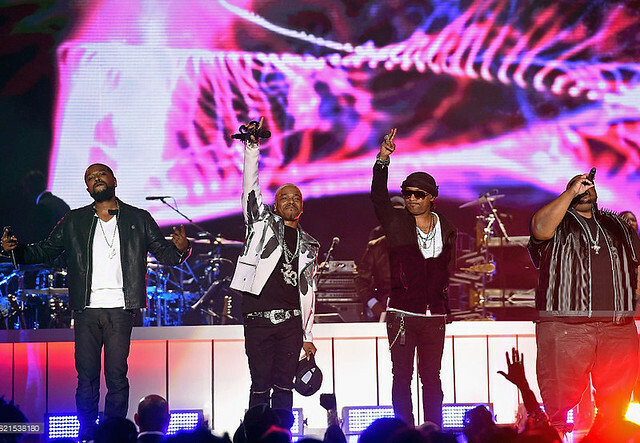 New lineup changes aside, Dru Hill vigorously demonstrated that their voices are well enough to belt out the intricate harmonies that made them famous. As fun as those solo hits may be, Dru Hill prove their power as a tight quartet with movement and meaning in their themes of fun, love, and heartache.